Please read the following carefully as it governs your use of the web pages hosted by Harpersfield Vineyards website(s): (harpersfield.com, harpersfieldwine.com, harpersfieldwinery.com, harpersfieldvineyards.com). By accessing or using our websites, you agree and consent to the following terms and conditions. If you do not accept the terms and conditions stated here, do not use Harpersfield VIneyard websites. This website is accessible worldwide to anyone with Internet access. Accessing and using the Service and Site is subject to the terms and conditions of this User Agreement and Copyright Notice as well as all applicable laws and regulations, including laws and regulations governing copyright and trademark. BY ACCESSING THE SERVICE AND THE SITES, YOU ACCEPT, WITHOUT LIMITATION OR QUALIFICATION, ALL OF THE TERMS AND CONDITIONS IN THIS USER AGREEMENT. Harpersfield Vineyard reserves the right to change these terms and conditions at any time. The changes will appear on this screen. By using Service and Site, you agree in advance to accept any changes. Materials used and displayed for Service and Site, including but not limited to text, software, photographs, graphics, illustrations and artwork, video, music and sound, names, logos, trademarks and service marks, are the property of the Harpersfield Vineyard or its licensors and are protected by copyright, trademark and other laws. Any such content may be displayed solely for your own personal noncommercial use. Because certain information Harpersfield Vineyard is treated as proprietary, you agree not to modify, reproduce, retransmit, distribute, disseminate, sell, publish, broadcast or circulate any such material without the written permission of the Harpersfield Vineyard. Your use of the Service and Site is at your own risk. Neither Harpersfield Vineyard nor any of its subsidiaries, divisions, affiliates, agents, representatives or licensors shall be liable to you or anyone else for any loss or injury or any direct, indirect, incidental, consequential, special, punitive or similar damages arising out of your access or use of, or your inability to access or use, the service and the sites and the information available on the Service and Site or arising out of any action taken in response to or as a result of any information available on the Service and Site. You hereby waive any and all claims against the Harpersfield Vineyard and its agents, representatives and licensors arising out of your use of the Service and Site and the information available thereon. Do not give your user name or password to others. You are responsible for maintaining the confidentiality of your user name and password in order to protect your information. You are responsible for all uses of your registration, whether or not authorized by you. If others use your password to post inappropriate material on the Site, you risk losing your access to the Site. You agree to notify Harpersfield Vineyard immediately of any unauthorized use of your registration and password. Do not present Harpersfield Vineyard Content or Materials (or permit Content and Materials to be presented) so that it appears to be available from a third party website. Do not send SPAM or commercial emails of any kind and do not send any unsolicited email to individuals, entities or Harpersfield Vineyard website users. Do not attempt to or actually access the website by any means other than through the interfaces provided by the website or by navigating to https://harpersfield.com using a web browser. Report inappropriate postings or conduct to Harpersfield Vineyard. 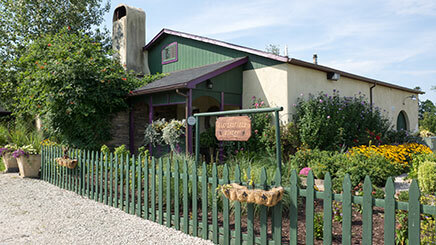 Harpersfield Vineyard makes no representations or warranties with respect to these pages, their Content and Materials (including, without limitation, material communicated by third parties) or communications from Customer Service representatives, all of which are provided on an “as is” and “as available” basis. Harpersfield Vineyard disclaims all warranties, express or implied, including without limitation the implied warranties of merchantability and fitness for a particular purpose. Harpersfield Vineyard makes no representations or warranties that the services provided by these pages or any customer service representatives will be uninterrupted or error-free, that defects will be corrected or that the pages or the server that makes them available are free from viruses, worms or other harmful components. If your use of the website results directly or indirectly in the need for servicing or replacing equipment or data, Harpersfield Vineyard is not responsible for those costs. Harpersfield Vineyard also makes no representations or warranties as to whether the information accessible via these pages or customer service representatives, including information posted by users or third parties, is accurate, complete, current, reliable or truthful. Harpersfield Vineyard assumes no responsibility for the timeliness, deletion, incorrect delivery or failure to store any user communications or personalization settings. Nothing on the Site shall be considered an endorsement, representation or warranty with respect to any user or third party, whether in regards to its web site, products, services, experience, recruiting, hiring or otherwise. No advice or information obtained by any user from Harpersfield Vineyard or its personnel shall create any warranty not expressly provided for in this Agreement. You agree that any reliance on materials/information posted by users or on any other form of communication with users will be at your own risk. Harpersfield Vineyard acts as, among other things, a portal for the online distribution and publication of user submitted information and has no obligation to screen communications or information in advance and is not responsible for screening or monitoring user posted material or information, although it reserves the right to do so. Harpersfield Vineyard makes no representations or guarantees regarding the effectiveness or timeliness of the website in meeting objectives of users. Harpersfield Vineyard does not guarantee that Documents created, checked or reviewed using the website, Documents written by Harpersfield Vineyard or materials posted by users will result in an agreement, contract or successful application, for whatever reason made, made by any user or third party. HARPERSFIELD VINEYARD RESERVES THE RIGHT AT ANY TIME TO MODIFY OR DISCONTINUE, TEMPORARILY OR PERMANENTLY, THE SITE (OR ANY PART THEREOF) WITH OR WITHOUT NOTICE. YOU AGREE THAT HARPERSFIELD VINEYARD SHALL NOT BE LIABLE TO YOU OR TO ANY THIRD PARTY FOR ANY SUCH MODIFICATION, SUSPENSION OR DISCONTINUANCE OF THE SITE. THE LIMITATIONS SET FORTH IN THE PRECEDING PARAGRAPH MAY NOT APPLY TO YOU BECAUSE SOME STATES OR JURISDICTIONS DO NOT ALLOW THE EXCLUSION OR LIMITATION OF LIABILITY FOR CONSEQUENTIAL OR INCIDENTAL DAMAGES. IF ANY LIMITATIONS ARE HELD INAPPLICABLE OR UNENFORCEABLE FOR ANY REASON, THEN HARPERSFIELD VINEYARD’S MAXIMUM LIABILITY TO YOU FOR ANY NON-DIRECT TYPE OF DAMAGES SHALL BE LIMITED TO U.S. $50.00 IN THE AGGREGATE. IN NO EVENT SHALL HARPERSFIELD VINEYARD (ITS PARENT, SUBSIDIARIES, AFFILIATES, OFFICERS, EMPLOYEES, AGENTS, PARTNERS AND LICENSORS OR ANYONE ELSE WHO HAS BEEN INVOLVED IN THE CREATION, PRODUCTION, OR DELIVERY OF THESE PAGES), BE LIABLE FOR ANY DIRECT DAMAGES IN EXCESS IN THE AGGREGATE OF US $50.00. IF ANY PART OF THE EXCLUSIONS OF DAMAGES OR LIMITATIONS OF LIABILITY SET FORTH HEREIN IS UNENFORCEABLE UNDER APPLICABLE LAW, SAPPHIRE FALLS WEB DESIGN’S AGGREGATE LIABILITY RELATED THERETO WILL BE LIMITED TO THE MAXIMUM EXTENT PERMITTED BY LAW, EVEN IF ANY REMEDY FAILS ITS ESSENTIAL PURPOSE. BECAUSE USER AUTHENTICATION OVER THE INTERNET IS DIFFICULT, HARPERSFIELD VINEYARD CANNOT AND DOES NOT CONFIRM EACH USER’S IDENTITY. WE ARE NOT INVOLVED IN USER-TO-USER DEALINGS NOR DO WE CONTROL THE BEHAVIOR OF PARTICIPANTS ON ANY SITE. THEREFORE, IN THE EVENT THAT YOU HAVE A DISPUTE WITH ONE OR MORE USERS, YOU RELEASE HARPERSFIELD VINEYARD (AND OUR AGENTS AND EMPLOYEES) FROM CLAIMS, DEMANDS AND DAMAGES (ACTUAL AND CONSEQUENTIAL AND DIRECT AND INDIRECT) OF EVERY KIND AND NATURE, KNOWN AND UNKNOWN, SUSPECTED AND UNSUSPECTED, DISCLOSED AND UNDISCLOSED, ARISING OUT OF OR IN ANY WAY CONNECTED WITH SUCH DISPUTES. The Site and all right, title and interest in and to the Site is the sole property of Harpersfield Vineyard and/or its Affiliates (including parent company) or its licensors, and is protected by U.S. copyright and international treaties. Harpersfield Vineyard reserves for itself and its licensors all other right, title and interest. All related products and service names, design marks and slogans are also the service marks or trademarks of Harpersfield Vineyard. In addition, the “look” and “feel” of the website (including color combinations, button shapes, layout, design and all other graphical elements) are protected by Harpersfield Vineyard’s trademarks, service marks and copyrights. All other product and service marks contained on the website are the trademarks of their respective owners. If you have a good faith belief that materials available on the Site infringe your copyright, send Harpersfield Vineyard a notice requesting that we remove the material or block access to it. If you believe in good faith that someone has wrongly filed a notice of copyright infringement against you, send Harpersfield Vineyard a counter-notice. Notices and counter-notices must meet the then-current statutory requirements imposed by federal law (see http://www.copyright.gov/ for details). Harpersfield Vineyard makes no representation that materials on these pages are appropriate or available for use in any particular location. Those who choose to access these pages do so on their own initiative and are responsible for compliance with local laws. You agree to defend, indemnify, and hold harmless Harpersfield Vineyard (and its officers, directors, employees and agents) from and against any third party claims, actions or demands (including, without limitation, costs, damages and reasonable legal and accounting fees) alleging or resulting from or in connection with your use of the website, Documents posted by you on the website or distributed by you through the website or your breach of this Agreement. Harpersfield Vineyard shall use reasonable efforts to provide prompt notice of any such claim, suit, or proceeding and may assist you, at your expense, in defending any such claim, suit or proceeding. This Agreement is effective until terminated. Harpersfield Vineyard, at its sole discretion, may terminate your access to or use of the Site, at any time and for any reason. Such termination, including deactivation or deletion of your password and user name, and all related information and files associated with it may happen without prior notice. Harpersfield Vineyard shall not be liable to you or any third party for any termination of your access to the Site or to any such information or files and shall not be required to make such information or files available to you after any termination.